Origami-inspired materials use folds in materials to embed powerful functionality. However, all that folding can be pretty labor intensive. 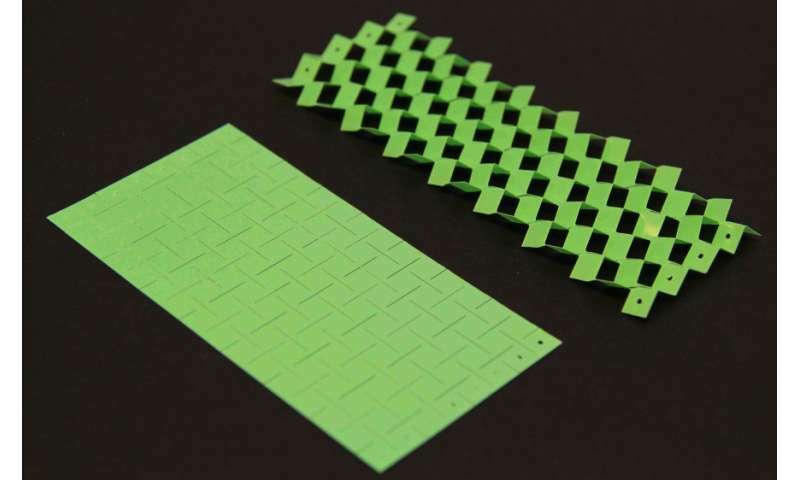 Now, researchers at the Harvard John A. Paulson School of Engineering and Applied Sciences (SEAS) are drawing material inspiration from another ancient Japanese paper craft—kirigami. Kirigami relies on cuts, rather than folds, to change the structure and function of materials. In a new paper published in Physical Review Letters, SEAS researchers demonstrate how a thin, perforated sheet can be transformed into a foldable 3D structure by simply stretching the cut material. "We find that applying sufficiently large amounts of stretching, buckling is triggered and results in the formation of a 3D structure comprising a well-organized pattern of mountains and valleys, very similar to popular origami folds such as the Miura-ori," said Ahmad Rafsanjani, a postdoctoral fellow at SEAS and first author of the paper. The team found that if the material is stretched more, the temporary deformations become permanent folds. The team also found that the pop-up pattern and resulting mechanical properties of the material can be controlled by varying the orientation of the cuts. "This study shows a robust pop-up strategy to manufacture complex morphable structures out of completely flat perforated sheets," said Katia Bertoldi, the John L. Loeb Associate Professor of the Natural Sciences at SEAS and senior author of the paper.